"The staff at Hockley Valley Resort FAR exceeded our expectations for our wedding day. Thank you for all you did to make our special day as perfect and flawless as possible. It was a picture perfect day, and we could not ask for more." “The professionalism and combined experience of the entire Hockley team made our reception as enjoyable & stress-free as a wedding can be." "I am so impressed by the entire weekend. From arrival at the resort to the special events, housekeeping details and assistance with set up and clean up. This resort and you especially, exceeded my expectations." Our Montclair and Aida Ballrooms are wonderful for indoor ceremonies throughout the year with seating for up to 300 of your guests. Make the most of your Resort Wedding and let us take care of all the details. Winter weddings from $92 per person. special savings for onsite ceremonies. *Plus applicable taxes and service charges. Restrictions apply. Minimum of 100 adult guests required. Onsite ceremonies available, additional charge applies. Valid January 1 – April 30, 2019. 18may - 26octmay 181:00 amoct 26WHY WAIT? 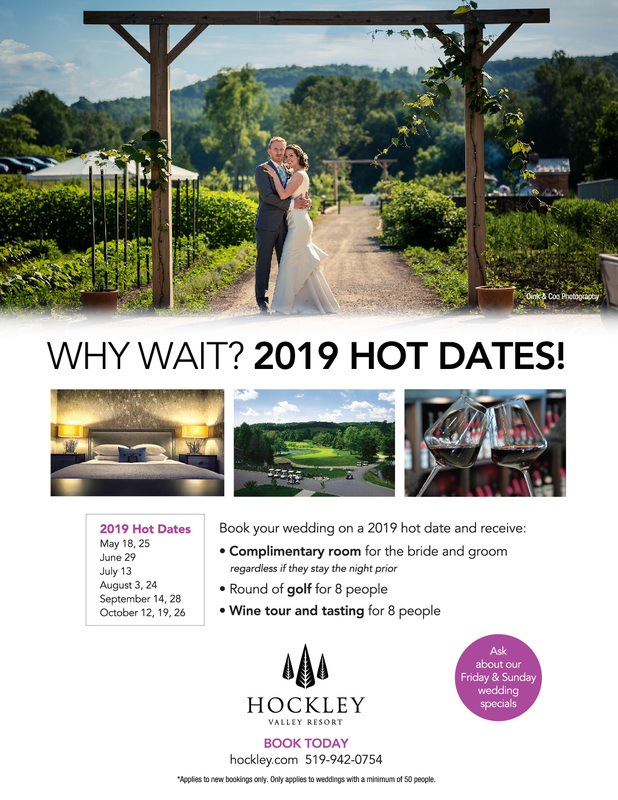 2019 HOT DATES! *Applies to new bookings only. Only applies to weddings with a minimum of 50 people.